The share price of Apple has pulled back sharply in recent months, so we are watching it closely. The all-time high was $232 per share on 3 October 2018. It got as low as $142 over the Christmas period, but has since rallied to last night's close of $153.31. As we mentioned earlier this week, sales of the new models of iPhones have been a little disappointing, especially in China. Keep in mind that Apple is the world's leading luxury consumer-goods company. It has wonderful profit margins, and regularly reports record sales and earnings. It dominates the high-end personal computer market, as well as those for smartphones and digital watches. It never discounts its products, and has raised prices in recent years. Its beautifully designed stores are tourist destinations. It has hundreds of millions of rich, repeat customers who are largely price-insensitive. As a result it generates a mountain of cash every quarter. 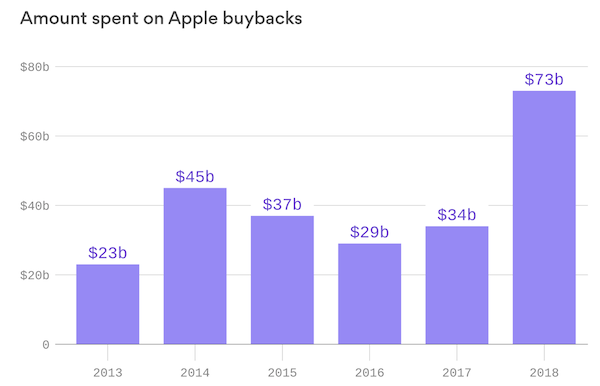 Apple has used a good deal of that cash in recent years to buy back its own shares, as you can see from the chart below. Remaining shareholders like us benefit directly, because it means that future profits are shared across a smaller base, and the earnings per-share keep rising. I'm not sure, but I would imagine that the team in charge of buybacks has been busy this last ten days?